BDE – When was Your Last One? I have a new favorite phrase. Something I declare after certain criteria have been met. 1. A day spent with the freedom to do whatever calls to me. 2. Captivating moments that are captured forever in my mind’s eye. 3. The connections I make with people are joyful, uplifting and touching. 4. I am inspired by the people I meet and their stories. 5. I feel expansively in love with myself, my life and everyone I know. My recent BDE just happened and it inspired me to share with you. 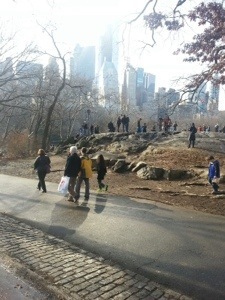 My family and I just spent the day walking through Central Park (#1). It is the weekend before Christmas and Nat King Cole’s soothing voice drifts through the air from the Welborn Skate Center. Families walking together block the path as the mixture of many different languages creates a fascinating noise of sound. The sun’s rays shine down on a group of teens posing on top of one of the many rock outcroppings in the park, casting their silhouettes in a halo of light (#2). On a whim, we accept the offer of a horse drawn carriage ride through the park. The swaying of the carriage and the sights, sounds and smells of the outdoors was very peaceful. I felt like we were inside a cocoon of calm while frantic energy swirled around us. It made me realize that I can feel calm inside, no matter what is going on around me. As I looked down on the faces of the people we passed, I saw one little girl smile and wiggle her fingers. I mimicked her gesture and felt connected to something much bigger than myself (#3). As we walked back to our hotel, we stumbled onto an outdoor market with many stalls of vendors selling their wares. A booth with black and white historical photos caught our eye and we were soon in a delightful conversation with a father and daughter team. They had immigrated from the Ukraine and loved to discover the history behind the photos that they sold. The shop owners were as fascinating as their products and it was was with great regret that we left their presence (#4). Chance encounters with people are what inspire me. Everyone has a story to tell and wisdom to share of living life from their vantage point. Maybe that is the whole point of a BDE – to find those connections with others who appear to be so different but who are really motivated by the same things I crave…respect, recognition and love (#5). When was your last BDE? Please share – it might just inspire someone else to look for their own BDE.